BE CAREFUL WHEN YOU OPEN UP THIS BOTTLE AND AWAKEN THIS VOLCANIC HOT SAUCE. IT'S A COMBINATION OF RED SERRANO AND CALABRIAN PEPPERS, INFUSED WITH GARLIC, ONIONS AND ITALIAN HERBS. THIS ITALIAN HOT SAUCE IS ONE OF A KIND AND PHENOMENAL ON PIZZA, PASTA, MEATBALLS, SAUSAGE AND PEPPERS, OR ANY ITALIAN FAVORITE TO TAKE YOUR FRA DIABLO EXPERIENCE TO A WHOLE NEW LEVEL. BEWARE WHEN OPENING THIS BOTTLE!! MARY IS BACK AND SHE'S A HOT MESS, DARING YOU TO SQUEEZE HER ALL OVER YOUR FAVORITE SEAFOOD. 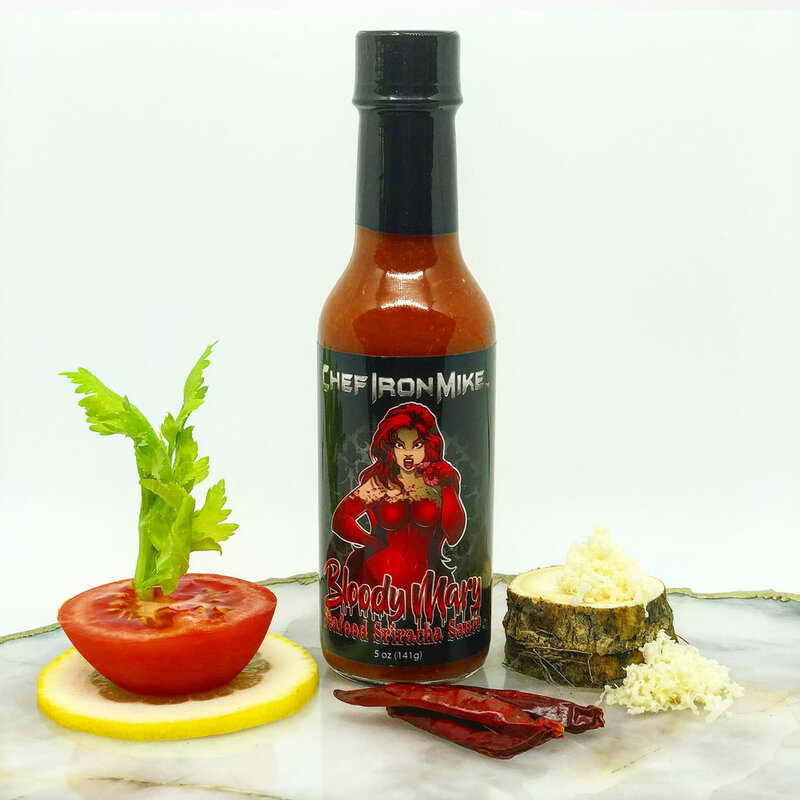 THIS BLOODY MARY FLAVORED HOT SAUCE IS A BLEND OF CAYENNE AND ARBOL PEPPERS, HORSERADISH, CELERY AND LEMON. IT'S SPECTACULAR ON SHRIMP OR CRAB COCKTAIL, RAW OYSTERS & CLAMS, FRIED SEAFOOD OR EVEN YOUR OWN BLOODY MARY COCKTAIL. BE MINDFUL WHEN YOU OPEN THIS BOTTLE OF FIERY MEXICAN HOT SAUCE. IT'S A COMBINATION OF FRESNO & CHIPOTLE PEPPERS, BLENDED WITH SOUTHWESTERN FLAVORS OF GARLIC, ONIONS, CUMIN, LIME AND CILANTRO. 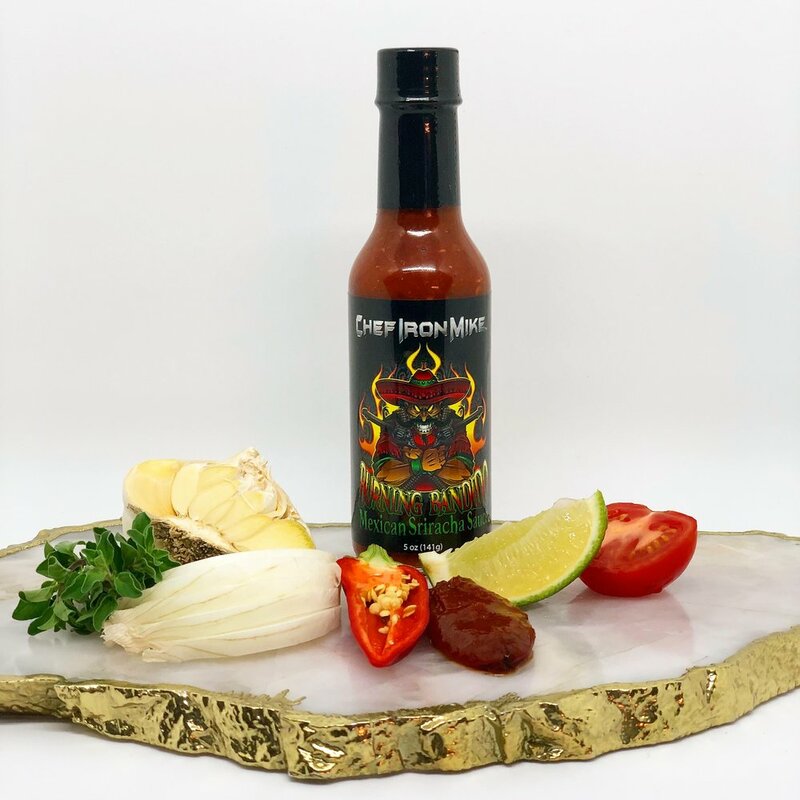 THIS AMAZING HOT SAUCE WILL ADD A BANG TO TACOS, QUESADILLA, ENCHILADAS, BURRITO, OR ANY FAVORITE MEXICAN OR SPANISH STYLE CUISINE. BE READY WHEN THIS SMOKING HOT BABE COMES ROLLING THROUGH YOUR TOWN. THIS IRRESISTIBLE HOT SAUCE IS A MINGLING OF JALAPENO & SERRANO PEPPERS, WITH TOMATILLOS, CILANTRO, GARLIC & ONION. SHOOT THIS SAUCE ALL OVER YOUR TACOS, QUESADILLAS, ENCHILADAS, BURRITO, OR ANY FAVORITE MEXICAN OR SPANISH STYLE DISH. PREPARE TO WALK THE PLANK WHEN YOU OPEN THIS BOTTLE OF CARIBBEAN STYLE HOT SAUCE. A GOLDEN BLEND OF SCOTCH BONNET & CHILI PEPPERS, WITH MANGO, MUSTARD, CURRY, CUMIN, AND A SPLASH OF ANISE. THIS SENSATIONAL SAUCE COMPLIMENTS CHICKEN, PORK, FISH, AND SEAFOOD. YOUR SHIP HAS COME IN, SURELY YOU WILL TREASURE THIS HOTTIE!!! YOU MIGHT WANT TO BE HOME WHEN YOU OPEN THIS BOTTLE AND THE WILD BUFFALO GETS LOOSE AND STARTS ROAMING THE RANGE. THIS EXPLOSIVE NEW WING SAUCE IS A STAMPEDE OF AGED CAYENNE & GHOST PEPPERS, GARLIC, ONION, CELERY & A TOUCH OF HONEY TO TRY AND SLOW HIM DOWN. DOUSE THIS HOT SAUCE ON YOUR WINGS TO ELEVATE YOUR TASTE BUDS TO TOWERING HEIGHTS. *Free Shipping on 3 bottles or more! BE MINDFUL WHEN YOU OPEN THIS BOTTLE OF FIERY MEXICAN HOT SAUCE. IT'S A COMBINATION OF FRESNO & CHIPOTLE PEPPERS, BLENDED WITH SOUTHWESTERN FLAVORS OF GARLIC, ONIONS, CUMIN, LIME AND CILANTRO. 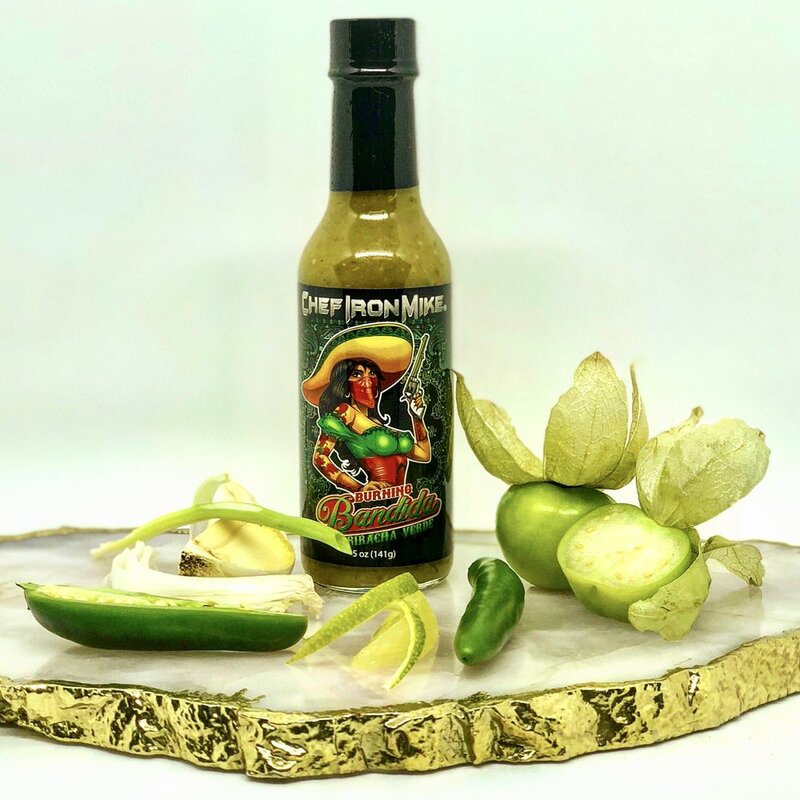 THIS AMAZING HOT SAUCE WILL ADD A BANG TO TACOS, QUESADILLA, ENCHILADAS, OR ANY FAVORITE MEXICAN OR SPANISH STYLE CUISINE. BE READY WHEN THIS SMOKING HOT BABE COMES ROLLING THROUGH YOUR TOWN. THIS IRRESISTIBLE HOT SAUCE IS A MINGLING OF JALAPENO & SERRANO PEPPERS, WITH TOMATILLOS, CILANTRO, GARLIC & ONION. SHOOT THIS SAUCE ALL OVER YOUR TACOS, QUESADILLAS, ENCHILADAS, OR ANY FAVORITE MEXICAN OR SPANISH STYLE DISH.